Download an Order for the Stations of the Cross for use in Ellsworth Kelly’s Austin and continue reading for more information. Marcel Breuer inspires me to resurrect and complete another long-languishing blog post draft. Though I almost feel I could just end the argument with this iPhone photo from yesterday. One of my absolute favorite blogs is a tumblr known as Architecture of Doom. Its mission is "to post mostly architecture that is often seen as bleak/gloomy/forbidding/desolate/unfortunate and totalitarian architecture." 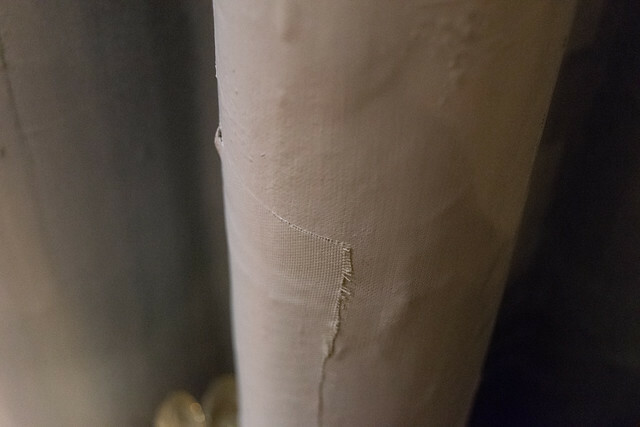 The posts also include examples of weathered or ruined aesthetic. 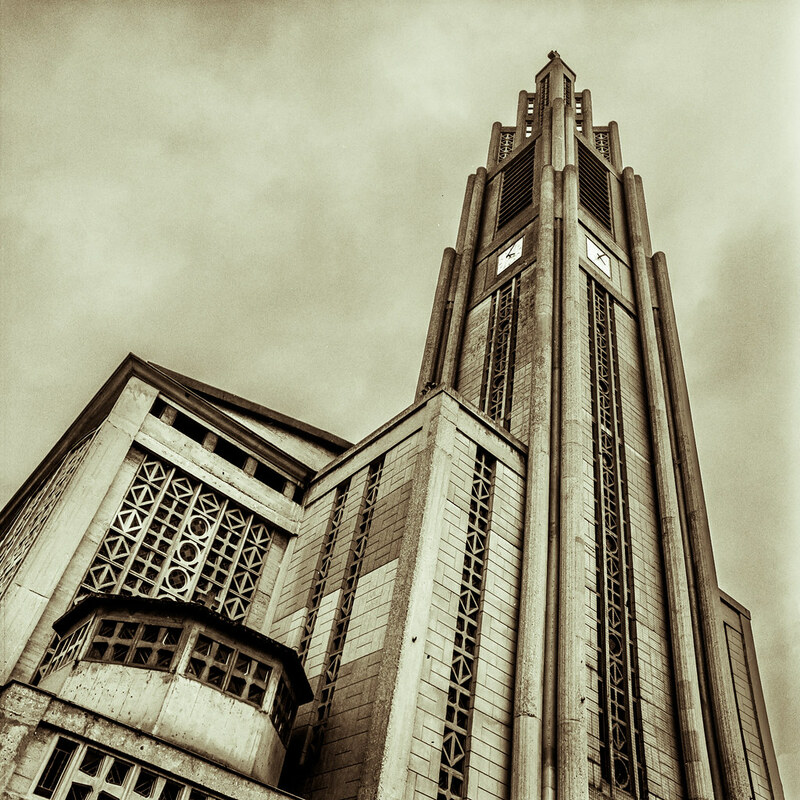 Some of the images are of totalitarian housing, but of course I am most interested in the churches. Religious buildings seem to be about a third of the images on the site. The curator has a great eye for compellingly beautiful images. The buildings and photos fit into a core aesthetic that is difficult to describe because they each fit for different reasons. Following this blog brought many surprises and new buildings or architects to investigate further. It also raised many challenging questions: the fetish of the beautiful ruin; the importance of pain & the "dark mystery of death" in Christian aesthetics; the difference between beauty & Beauty; the role of taste in Beauty; and architectural desire to express monumentality & permanence. This is not going to be a popular post in some circles because the nebulous aesthetic that combines these images is often difficult and maligned. Their outward formal novelty has also become linked to other, more fundamentally challenging contemporary changes in social and religious attitudes. Such links cannot be assumed to be universally valid, even though they are most prominent by virtue of their fitting critics' and historians' anticipated narratives driven by those same social and religious attitudes that tend to seek the novel and discontinuous. Even those who claim to espouse aesthetics based in theological principles assume that if something appears at odds with the appearances they associate with orthodoxy, it must indicate a theology at odds with their own. I've worked to find ways to speak about these ideas that would be welcome to many audiences. I'm confident I have failed and will most likely never be unable to fail in that effort. It is an attempt to answer questions honestlythat were probably not honestly asked. So I offer these thoughts and experiences in goodwill, for what it's worth. And there are some very good reasons that people can't see there's a baby in this bathwater. Sometimes it is bad architecture; sometimes it is good photography that is a bad representation of architecture (good or bad). But sometimes it's just misperception and categorical overgeneralization. Often in these circles, it is the application the ideology of some of who designed “modern” churches to all who designed modern churches. 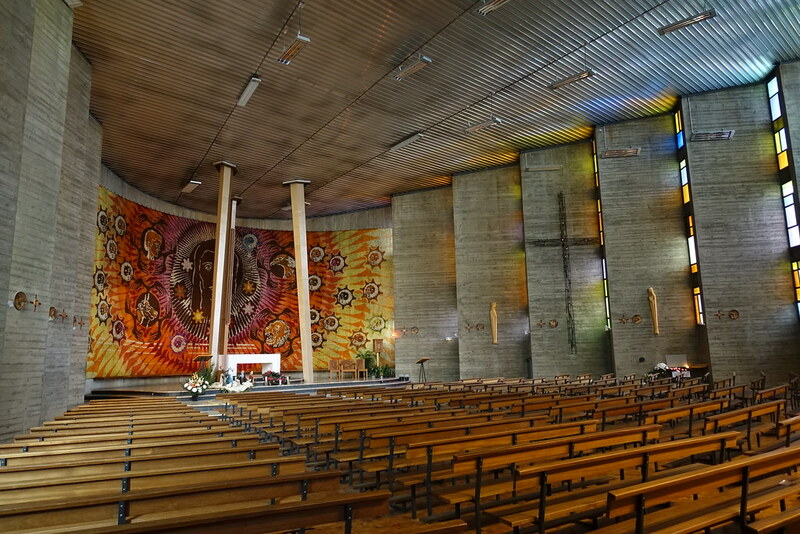 E. A. Sövik (and his influence on the 1978 document Environment and Art in Catholic Worship) is a particular target for his “non-church” centrum and the directive to do everything in one’s power to prevent the building from attaining a sacral quality. This is, of course, a highly reductive conception of “church,” as is any that focuses exclusively on one aspect of that ontological category, regardless of the category chosen. A building which only attempts to embody the image of the completed Heavenly Jerusalem is will likewise reductive, and there are those who are equally put off by that failure. And so you have the "Ugly as Sin" crowd for whom any church that appears modern is automatically a non-church. But not all of the buildings shown here were designed to deemphasize the transcendent or sacred character of the building and the worship within. In fact, for that the majority of them the intent is to heighten the experience of the sublime, something that concrete is particularly suited for when allowed to soar. Plenty of utilitarian buildings and infrastructure use concrete. But its use does not universally symbolically equate to the mundane. There are types of concrete and methods of making concrete buildings that are more and less refined, are more and less permanent, fall more or less in different aesthetic categories. And besides, infrastructure can be beautiful, as anyone who has been to Iceland or the Hoover Dam will readily attest. I once heard a professor ascribe to Rudolph Schwarz a highly subjective idea of God through an architecture that wants to “let you choose your own image of God.” I would say that is entirely antithetical to the very precise and densely complex understanding of images of God (could any precisely articulated understanding of God not be densely complex?) and of the church evident in his writing as well as the very precise understanding of liturgy provided by his close collaborator, Romano Guardini. The source of the objection and (sole) evidence was the apparent lack of images in the church (St. Fronleichnam, Aachen), especially behind the altar. “Images” in the limited meaning of statues and pictures, since apparently elements like space, sequence, material, proportion, contrast, light, etc. cannot be images, I guess? And dignity and subtlety are not admirable qualities? But nobody likes these buildings. 1. Because they exist. Many peoples have chosen to build in ways that result in these images of church, and they had acute needs and reasons for these expressions. We can't just ignore the past we don't like and discredit other's cultural output because we happen to disagree with it. 2. Because they are important. These churches are incredibly important to look at even if they offend your personal sensibilities. Perhaps even more so because they offend your sensibilities. Even if it is not advisable to build in this manner for certain contexts, there are material and spiritual revelations contained in these buildings on which we can build. If we desire to build in continuity with our church throughout the ages, it will not do to create a point of discontinuity because we chose to read the recent past from a hermeneutic of rupture. 3. Because they are Beautiful. These buildings tend naturally toward the awe-inspiring sublime as the lay bare the brilliance of their form and radiate intelligibility. And they are Beautiful because they are Good and True. They reveal realities of the nature of the church and the Body of Christ (that are True) and our relationships to them and activities within them (that are Good). Are they invalid merely because one aspect of the portion of Truth they manifest is uncomfortable and difficult? Now to be perfectly clear, I do not advocate looking at these buildings and learning to appreciate them in order to use them as universal models for all churches. It seems with religious buildings, even more than with art and architecture in general, the leap from taste to moral judgment is a short one. I have often found that people take my appreciations of specific buildings or concepts of buildings to mean that they are the proposal of a universal model. It as though there is an unspoken assumption that our job is to find the one church form that works for everyone everywhere. There can be no universal model or style for church buildings. And those aspects of reality and of the ontology of church that they express more articulately than other build forms can never be excluded from a church that seeks to embody something that approaches the fullness of the identity of the Mystical Body of Christ. Besides, I like them. Many of them. So you can't say nobody does. When it comes to Beauty, your taste (and mine) is irrelevant. Taste, like conscience, is one of those things that needs to be cultivated and conformed. The thing is, I genuinely find many of these church buildings to be sacred, inspiring, beautiful, moving, rich, worthy… And not in simply an academic or historical study; in my time in my own experience, outside considerations of their original context or the intent of their commissioners, architects, and builders. And this is especially true when I participate in their completion in worship. To argue that these are bad and should not exist because you do not find them inspiring/beautiful means what? That my aesthetic experience is invalid? That my experience/existence as a human is invalid? That my perception is disordered? Or more importantly, that my theology is flawed? I’m overplaying the personal affront aspect of this a bit to call attention to the moral implications of an exclusivity of cultural (and now more than ever, sub-cultural) expression and the tyranny of taste. But honestly, it has been the insinuations of conversations I’ve heard recently among people who value (what they see as) orthodoxy & tradition and who believe, as do I, that the material form of things is important and should signify its ontology. Isn't beauty in the eye of the beholder? The tendency at this point would be to fall into the question of whether Beauty is objective or subjective. We could take the easy way out and mindlessly repeat the old adage “beauty is in the eye of the beholder,” agree to disagree, whatever. Or you can just dismiss my position into the category of subjective beauty and attempt to inculturate me and cure my obvious deficiencies. The only problem is that the old adage is false. Beauty is transcendent. There is an objective Beauty (and Truth and Goodness). And the vast majority of what they—those who have no qualms insulting to my face what I attempt to share as meaningful experiences in beautiful buildings—hold up as beautiful indeed manifest that objective Beauty, and much of it quite readily to a very high degree. Here’s the catch. To affirm that there is an objective Truth (which, but the way, is a person) is not the same as claiming to know precisely and fully what it/him is. Nor is it to have the ability to express it/him. We need to make the distinction between the assertion that there is objective truth and the claim of possessing it in totality. This is an uncommon position in my experience. I suspect the kind of person who finds comfort in the idea of objectivity tends to lack the humility required to make that distinction. Not only does the familiar phenomenon of differences of opinion about what is beautiful fail to negate transcendent objectivity, it is its very proof. The “richness” of an “almost inexhaustible variety” is required to approach comprehension of the one true Beauty. One homogenous mode is insufficient, and by extension, neither is an individual observer. That so much depends on the receptive ability of the receivers is not a justification relativism. It is rather an acknowledgment that people are different. And this means we can be decent and charitable to people who perceive differently the manifestations of beauty in things. Beauty should inspire love: less the eros that inspires possession and more the philia that inspires sharing and celebration leading to caritas. For the one responsible for participation in the manifestation of beauty on behalf of a community—the church architect—acknowledgment of the variables involved in the receiver also means there is great value in those cultural conventions to which more people are receptive and through which more people are able to see the one true beauty. But this neither precludes the other manifestations nor dehumanizes its receptive perceivers. We can also say that in the context of church architecture the most propitious time for the manifestation of beauty is in its use in worship. At its best, bold, straightforward, abstracted architectures found resonance with those seeking to emphasize and clarify the liturgy. In these cases (certainly not in all), the simplicity served legibility and presence, not iconoclasm and absence. And it incorporated the highest capabilities of the best building craft of the time to make a worthy environment. By now enough images have gone by that the types of architectures in question here should be clear. Most of these examples fall under the moniker "brutalism," the name of a particular thread of post-war architecture that emphasizes raw concrete materials and massive geometric forms. Popular usage would apply the name to even those that do not fit the more technical usage, but the English interpretation of the moniker seems fitting to the average viewer… and they don’t mean it nicely. Most stylistic labels facilitate an unfortunate reduction and generalization, and the church architectures in this set of images suffers more than most from that laziness. There are buildings here that are good and buildings that are bad. The typically black and white photography poorly conveys the nuances of the architecture and makes it difficult to distinguish which is which. But what's in the name? Proponents like to point out that the entomological source is from béton brut which is literally "reinforced concrete" and not from the perception that these buildings are cold, harsh, and brutal. But if the shoe fits... So the label "brutalism" gets used now to describe (and degrade) any austere modernist building regardless of its material or its forms that might, in fact, provide soft, warm, and poetic experiences in the flesh. That is why a number of brick-faced buildings are included. 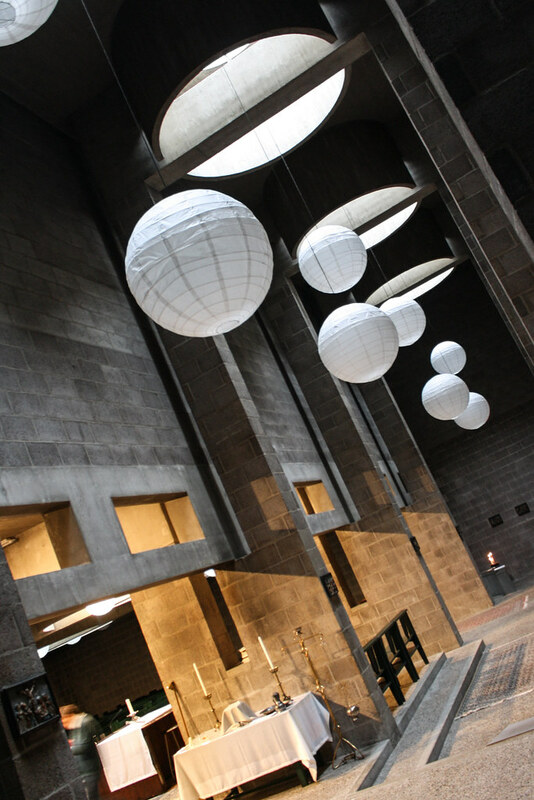 Even the exterior of Breuer's St John's Abbey is clad in granite, but the exposed hand-formed concrete has such compelling vitality that that is all that anyone looks at. 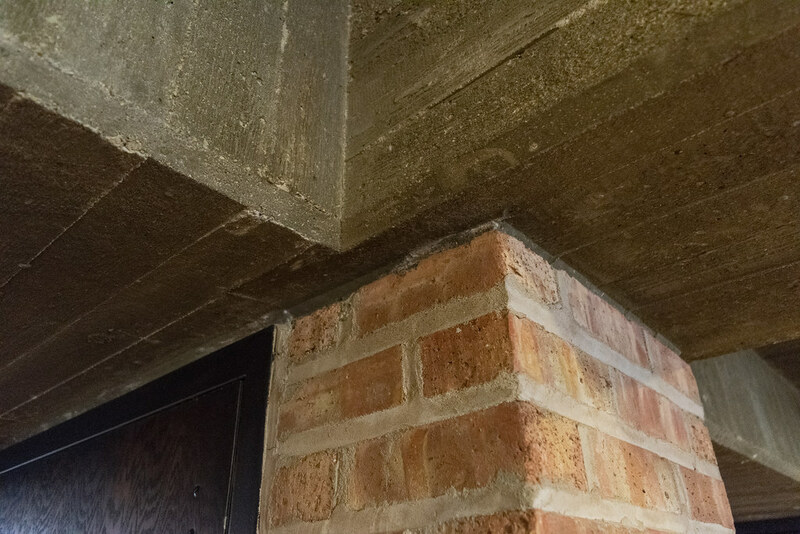 Even that was originally assumed to need to be painted until Breuer and the abbey saw the quality of the concrete work and the tone it imparted to the interior. 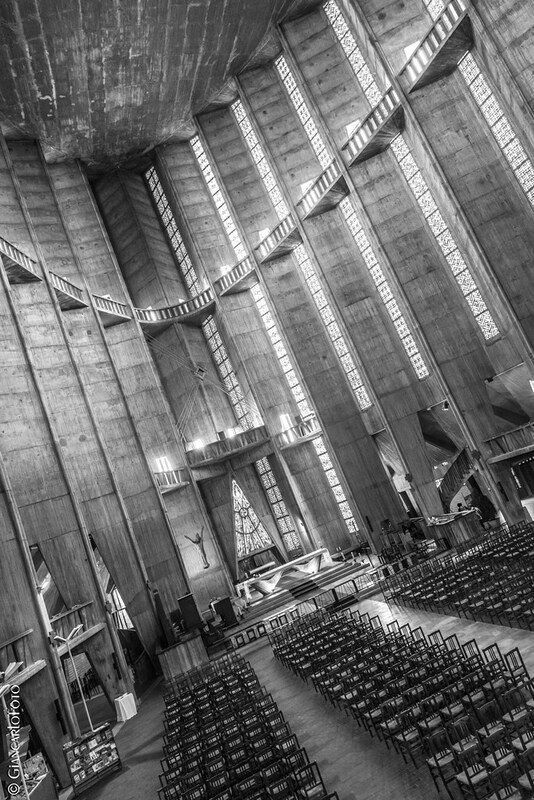 Raw concrete in architecture owes much of its origin to Auguste Perret, who is frequently overshadowed by his pupil Le Corbusier, and indeed to his designs for churches: Église Notre-Dame du Raincy (1922-1923) and Saint-Joseph, Le Havre (1951–58). But it was the imposingly heroic housing developments in England and the Soviet countries where Brutalism most strongly took root. Unfortunately, the vast majority of these buildings were low fidelity copies that lack both the interior spaciousness and the sunny climes of the best examples of this architecture, such as Le Corbusier's bloc at Marseilles. I recommend reading Jonathan Glancey's article about some of the British examples for more background. The role of the camera in modern architecture cannot be understated; it contributed both the dissemination of previously inaccessible architectural work and to the corruption of that information. The photograph imparts the confidence of reality despite its technical limitations, to say nothing of intentional artistic manipulation. A building learned from photographs is not the same as a building lived in. A building copied from photographs copies only its superficial qualities. The incongruity between life and the photographic image works both ways. There are harsh buildings that are difficult to maintain and uncomfortable to inhabit that also provide the opportunity for strikingly dramatic, even sublime, photography because of their roughly contrasting materials and stark handling of the play of light. There are others that look drab, uneventful, and even wrong in photographs that turn out to have an incredibly surprising life when activating by their use that is extremely appropriate and dignified for the type of worship it supports. I had that experience at Pastoor van Ars, Den Haag (St John Vianney, The Hague). Its published documentation suggests it might falls into the heroic-artistic camp, but it is so hopelessly difficult to describe in print. Honestly, I nearly skipped it on my itinerary but went because I was able to time my visit with a mass and because it is in too many standard history texts not to have seen given the near opportunity. I also had an inkling that there was more to it than its photographs and descriptions reveal, especially given van Eyck's involvement with Team X. Walking in, I honestly did not recognize it. And the way it framed the liturgy lent an unparalleled sense of ritual intentionality and straightforwardness. I couldn't wait to come home and publish my photos to finally explain the warmth of the space and the softness of the walls... but of course, they look almost as stoic and harsh as all the rest and can't capture all of the overlapping spaces and views. But can they be churches? 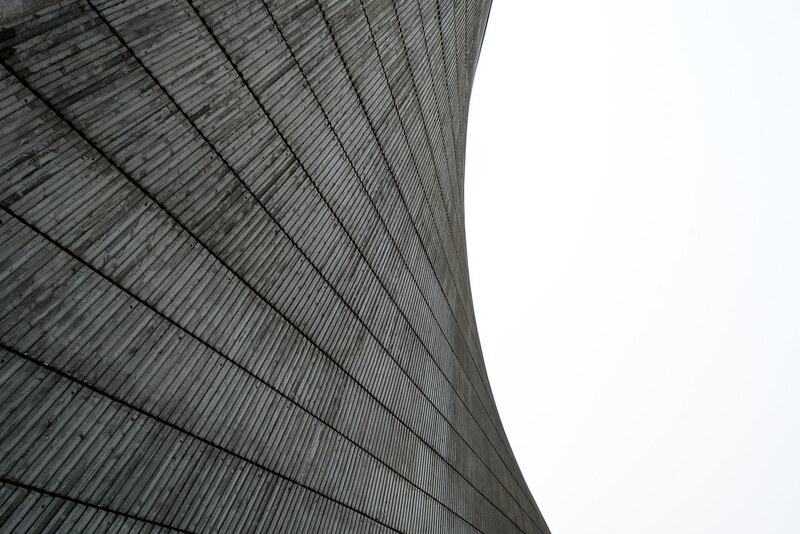 Perhaps you are ready to acknowledge the beauty of a concrete factory, the propriety of its form and material to its purpose, the legibility of its use. Saying that a building “doesn’t look like a church” is not a valid criticism. This does not mean that the confusion of building types is not problematic, nor does it mean that cultural conventions are irrelevant. A church needs to embody, express, and enable the church. Rather, its invalidity rests in the limitation of the preconceived models of what does not look like a church (often more than those about what a church does look like). The criticism that a building "doesn't look like a church" says more about the viewer than it does about the building. It also tends to focus on the externalities and superficial image of a building rather than the interior character or quality. 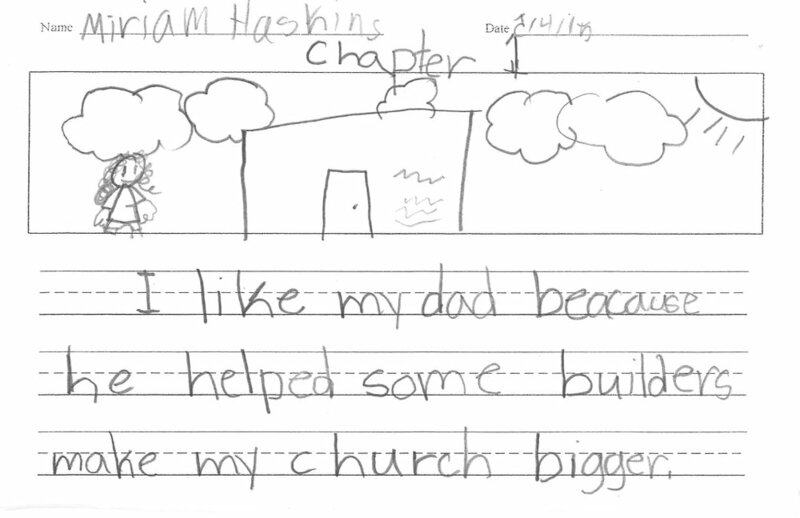 My daughters often surprised me as toddlers with their reactions to church buildings that even I would have thought might fall outside legibility as churches. Yet they identify them as church as respond with their childlike wonder, awe, reverence, and prayer. They respond to what a church is about far more than the culturally acquired affectations of churchiness. Buildings are not the type of vessels intended here, but the analogous application seems obvious in principle. The requirement for materials that be “truly noble in the common estimation within a given region” is challenging. Given the extent to which what is left of our idea of a monolithic culture has specialized and fragmented, should we only accept the most base and broad? American churches seem to be okay with the resulting mediocrity. I am not. Perhaps "given region" or culture is too small and we should account for variances in the way that we used to have the German and French and Polish neighborhood churches in places like Chicago and Detroit. Specificity and character were welcome, even if the result erred on the divisive. Then again, I have had the experience of being paradoxically disqualified to speak to questions of church architecture by a prominent proponent of church building on account of having been trained as an architect. That problem aside, concrete has a wide range of mixes and methods that can be utilitarian or refined as needed. Likewise, brick can be cheap homogenous running bond, or it can be hand-crafted and hand-laid in structural or decorative coursing. Where brutalist or similar buildings shine, however, is in the avoidance of being "common vessels [buildings]" or "mere vessels [buildings]." At least for the ones that people tend to photograph, that seems to be the case. As much as concrete can be used for utilitarian warehouses or anonymous infrastructure, the celebrated religious buildings are clearly more than mere buildings. Concrete structures enable large spans and tall volumes at relatively economic costs. There is no greater element to distinguish between a mere building and something more noble and worthy than the "waste" of space found in a sculptural volume. What can they possibly express? We have said that these buildings are Beautiful (even when not pretty) because they express aspects of the realities of the nature of the church and the Body of Christ (that are True) and our relationships to them and activities within them (that are Good). But which aspects are those, and are they sufficient to justify each buildings' use as a church, especially a parish church? It has long been my position that the church needs all of those expressions she has brought forth under her activity to collectively manifest the whole of her identity and that of her bridegroom whose body she also is. No one form, arrangement, style, or even scale of building would be sufficient to wholly encapsulate what a church is. This is, I believe, the ultimate lesson of Schwarz's The Church Incarnate. Her liturgy expresses great joy, abject awe, and desolate sorrow. Built primarily of word and action arrayed over time, it has a capacity for adjusting to the cycles of life. Architecture is more limited in its expressive range, especially in its facility to modulate. So it must choose what aspects of her worship the building will reflect. 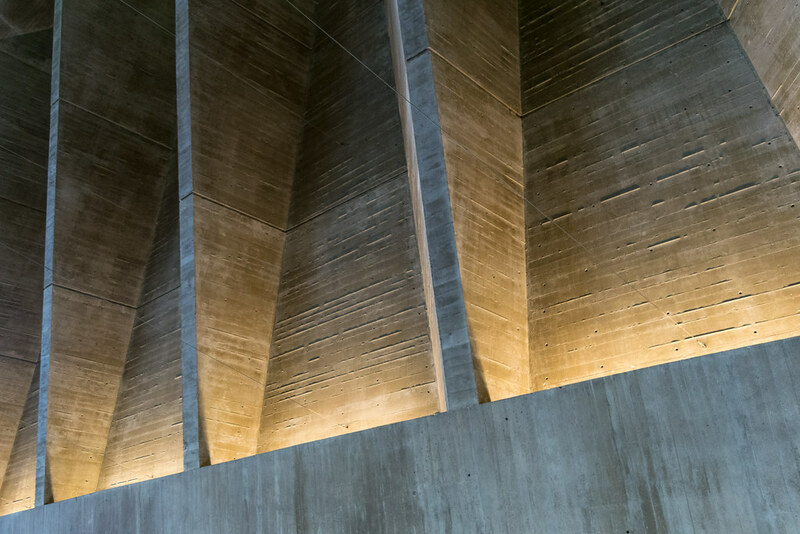 Brutalist church architecture fails—as all church architecture fails—when its range of liturgical postures and attitudes falls short of support the fullness of worship throughout the liturgical year, the rites that mark stages in our lives, and throughout time. Expectations for the breadth of expression are rightly higher for a parish church than a private chapel or monastic oratory, but this is an impossible task. So what do these images of buildings express? Here are but a few generalities that reflect some of the common concerns of the mid to late 20th century as they apply to churches. Permanence. One of the primal motivations for building is to make permanent an experience by marking, commemorating, or making perceptible an experience. This impetus is encoded in the scriptural accounts of sacred places from Jacob's stone at Bethel to the Transfiguration on Tabor. Most of these churches come out of post-war reconstruction. In the midst of that destruction and uncertainty, the appeal of permanence, lending a sense of stability, makes sense. And permanence is certainly an attribute of the church. Increasingly rapid technological and social changes through the latter half of the 20th century similarly make the permanence of the church a desirable counterpoint to an increasingly ephemeral culture. Monumentality. Monumentality is a constant in much of religious architecture. In the twentieth century, there were various movements away from monumental church buildings and toward more communal or familial expressions of church. Some expressions of heroic monumentality served a reaction against more humble, domestic church buildings. Others sought to achieve smaller-scale monumental architecture through materiality, sculptural forms, appeals to permanence, etc. Stout monolithic buildings readily operate on the level of the monument. Security. 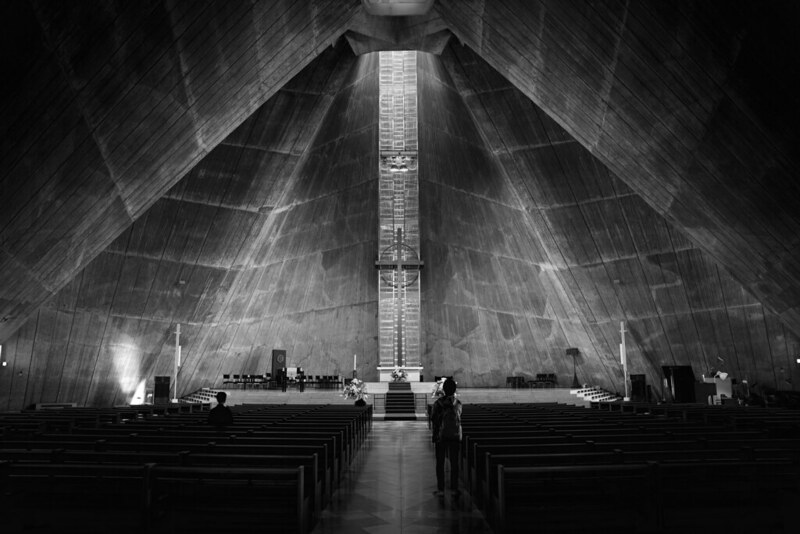 Some concrete churches resemble specific World War II armaments and Cold War bunkers. Architecture of Doom has tags for "bunker" "zombie proof." Most current attacks against these architectures seem to forget the context in which they were built. Having just realized that we could literally destroy the world, and with people actively threatening to do it, is it so surprising that one appeal of religion would fall along the lines of protection, stability, and security? Weathering. Architectural permanence may be a primary ambition, but it also tends toward hubris. One of the weaknesses of these architectures follows from the presumption of their permanence and the idea that they should therefore be low maintenance. A building is a living (and ideally a long-lived) thing, so there is decay, but there is patina. Even within decay, there is ordered and disordered decay. A frail body is ordered decay; an abandoned person, left to starve on the side of the road is disordered decay; the happy death—no matter how hard—of a beloved wrinkled old loved one is beautiful. Pope St John Paul II taught us that magnificently. Thus the marks of the passage of time do not necessarily represent fallen nature. Novelty. That concrete is first a liquid means the choice of material is almost non-deterministic. The expressive possibilities for form, void, and for their illumination are nearly endless. I don't think a church building should never seek novelty for its own sake. It is not the place of heroic-activist architects to impose their own images of God or self (if they know the difference) on people, as tempting as that is to one type of megalomaniacal person unfortunately drawn to the profession. But there is great value in being derailed from complacency and familiarity as challenge presents opportunities for maturing. At least that is the case when the content of the challenge is rooted in actual, if difficult, Truth (keep reading for more on that). The ability to see the continuity of core principles between familiar and unfamiliar forms is an invaluable practice to form spirituality beyond superficiality. Creativity/Creation. 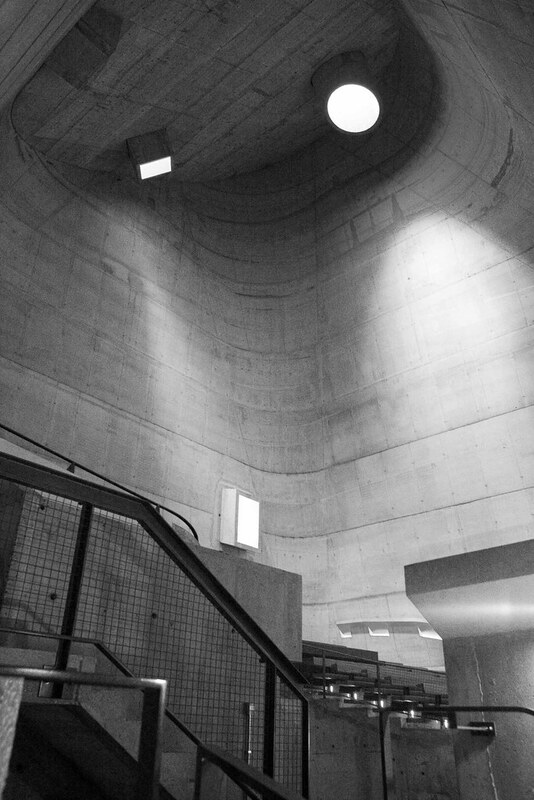 The fluid plasticity of concrete becoming rigid form is itself an image of creation. Eugene Wukasch, a mid-century Lutheran architect and engineer from Austin, gave a speech to the American Concrete Institute in 1988 that he called "The Good, The Beautiful, and the Concrete." This seems an odd group to stand before and wax poetic about the metaphorical richness of the material and make clever allusion to Christian metaphysics. In his words, raw concrete "resembles the uncreated world at the beginning of time; it is, to use the words of Genesis, 'without form and void.' It requires mortal hands to mold it as a sculptor molds a bust or abstract form. 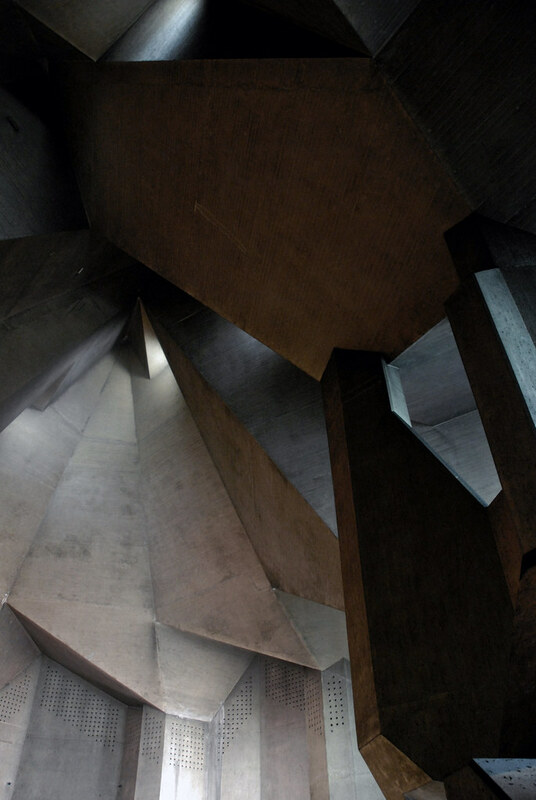 Granted, we never escape fundamental human limitations, but raw concrete makes us creators. It takes us into the realm of art which transcends mortal bounds." Body. There is something profoundly corporeal about these forms, whether from their muscular expression or the cohesive expression of their materiality. Body analogies carry through these buildings well, which contributes to the next category: numinosity. Numinosity. Buildings in this vein are not only monumental; they tend to have a profound presence to them. I have heard many pastors, monks, and congregants who inhabit them speak of them as characters and as participants in the worship. They use language that sounds like they are speaking of a delightful old friend. The phenomenon is not unique to these buildings, but it has been surprisingly common. And it is a sign of a truly great building. A Corollary to that character, the more sculptural volumes can be uniquely receptive to the presence of the community met with the presence of the divine. Their warmth and reverberance, combined with lighting (or even incense) that completes the activation of the space, seems to make the intangible tangible. 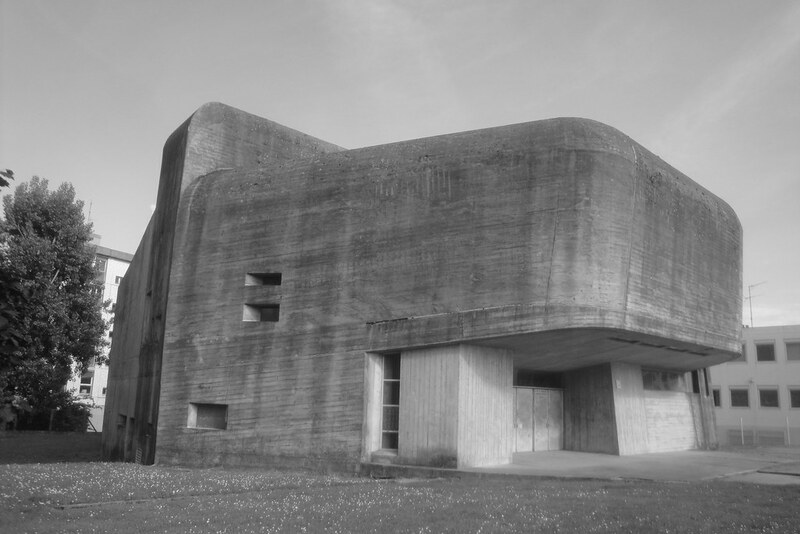 Even the most bunker-like, with massively thick concrete walls, can have the most sensuously curved forms, suggesting not a military defensive security, but an enveloping, womb-like safety. Weight. Weight can mean the heaviness of sorrow and mourning (see next item), but it can also mean solemnity and gravity. Heavy forms allows solemnity and dynamism to coexist in a space, both reinforcing and subverting expectations of formality that are often proper to religious places. Suffering & Ugliness. That's a big one that deserves its own section to conclude. In my mind, the fact that the response of many to some of the buildings in question is a degree of apprehension or revulsion does reinforce their beauty. We must consider that Beauty may not preclude suffering and ugliness. In fact, it cannot. One of the views expressed by some at the Liturgical Institute was the idea that the church should be ordered and organized through a very remedial structure so that the mind can rest because in heaven the mind is at rest. As though we cannot have both depth and accessible legibility. I was shocked to hear this expressed by people who the same day criticized the choice of simplistic, romantic, and comforting hymns at a funeral Mass to replace the (Latin Rite) church’s rich and symbolic propers that duly address the complexity of emotions, the actual needs for different prayers, and the profound hope in the reality of the resurrection the church affirms at the death of its members. A church which solely expresses suffering would be as insufferable as vapid pastels and putti. But none of the buildings in these genres which I have personally visited have been anywhere close to pure suffering. 9.9 But our soul, my brethren, is unlovely by reason of iniquity: by loving God it becomes lovely. What a love must that be that makes the lover beautiful! But God is always lovely, never unlovely, never changeable. Who is always lovely first loved us; and what were we when He loved us but foul and unlovely? But not to leave us foul; no, but to change us, and of unlovely make us lovely. How shall we become lovely? By loving Him who is always lovely. As the love increases in thee, so the loveliness increases: for love is itself the beauty of the soul. “Let us love, because He first loved us.” Hear the apostle Paul: “But God showed His love in us, in that while we were yet sinners, Christ died for us:” the just for the unjust, the beautiful for the foul. How find we Jesus beautiful? “Thou art beauteous in loveliness surpassing the sons of men; grace is poured upon thy lips.” Why so? Again see why it is that He is fair; “Beauteous in loveliness surpassing the sons of men:” because “In the beginning was the Word, and the Word was with God, and the Word was God.” But in that He took flesh, He took upon Him, as it were, thy foulness, i.e. thy mortality, that He might adapt Himself to thee, and become suited to thee, and stir thee up to the love of the beauteousness within. Where then in Scripture do we find Jesus uncomely and deformed, as we have found Him comely and “beauteous in loveliness surpassing the sons of men?” where find we Him also deformed? Ask Esaias: “And we saw Him, and He had no form nor comeliness.” There now are two flutes which seem to make discordant sounds: howbeit one Spirit breathes into both. By this it is said, “Beauteous in loveliness surpassing the sons of men:” by that it is said in Esaias, “We saw Him, and He had no form nor comeliness.” By one Spirit are both flutes filled, they make no dissonance. Turn not away thine ears, apply the understanding. Let us ask the apostle Paul, and let him expound to us the unison of the two flutes. Let him sound to us the note, “Beauteous in loveliness surpassing the sons of men.—Who, being in the form of God, thought it not robbery to be equal with God.” Let him sound to us also the note, “We saw Him, and He had no form nor comeliness.—He made Himself of no reputation, taking upon Him the form of a servant, made in the likeness of men, and in fashion found as man. He had no form nor comeliness,” that He might give thee form and comeliness. What form? what comeliness? The love which is in charity: that loving, thou mayest run; running, mayest love. The implication is that ugliness may express the same Spirit as beauty, especially when the identity of Christ and the manifestation of his body are the content of expression. This does not mean that ugly buildings are necessarily beautiful; such an assumption—and the resultant fetishization of the isolated form unredeemed and out of context, as often occurs among the subculture of architects—falls into what Ratzinger calls the "cult of the ugly" where apparent beauty is deception and the vulgar stands in for the truth. There the spirit that fills the flute is different. Similarly, focusing solely on pain and suffering as a mode of spirituality is a symptom of the excessive individualism of personal piety. And its divorced from the core spirituality of the church, that is her liturgy, which incorporates and transcends human suffering in due season and in the context of its metanarrative. There is no shortage of residential architecture truly suffocates life by its totalitarian intent (whether guided by the desire for absolute control or maximum profits). And there are certainly churches among the examples in this post which injure or impede worship for some people even beyond the question of taste. But the challenge of reconciling the truth in comeliness with the truth in ugliness means that we need to check the knee-jerk dismissal of what appears unpleasant as false merely because it is difficult or not what we are familiar with if we are to grow beyond the easy and comfortable forms of sentimental spirituality. Light and love in an architecture of dark mystery can afford an opportunity to "put away childish things" and thus approach the deepest truth of reality. In John chapter 6, when Jesus most fully reveals his identity (as Son of Man, sent from the Father) and activity (as Bread of Life who raises up those entrusted to him at the last day) by foreshadowing his death & resurrection (and the Eucharist), "many of his disciples went back to their old ways, and walked no more in his company" because the teaching was difficult. We cannot expect everything to be comfortable and happy in the church. Treating the confounding realities in this discourse as simple, dulled by familiarity, sells it short. A distinguishing characteristic of these architectures is the harsh thickness of rough concrete and brick walls. What initially appears stark imposing, if it is indeed imbued with the truth of Christ, transforms through light, through action and word, through weathering and use. The more expressive photographs reveal this potential, but it is only fully realized through the phenomena of their use. Thus it is even more critical for these architectures to complement the liturgy and achieve an interior humilty without losing the strength of their presence. 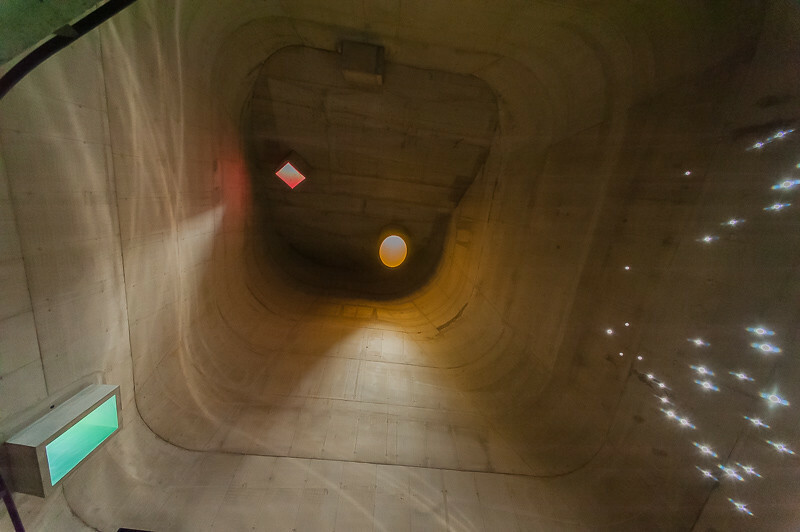 Architectural phenomena participate in "creation being itself." The beauty in weathering comes from expressing time-taking, deterministic pattern-generation, and cycles of growth and decay. The beauty of unfinished on-going constructions comes from the narrative of sub-creation, participation between generations, and the continuity and vitality of the church. The beauty of raw materials comes from the authenticity of natural matter, artifacts of God's creation mingling with artifacts of our creation. By virtue of the Word acting in creation and the Incarnation, the divine permeates creation; the resurrection of the body means that creation will be redeemed and restored, not discarded for a separate reality in a heaven elsewhere. That is why Christ took on "the form of a servant, made in the likeness of men, and in fashion found as man. He had no form nor comeliness." An architecture that desires to recreate a pure image of heaven apart from the occasional messiness of earth is not only impossible but akin to the heresy of denying the humanity of Christ. The tomb of Bertram Grosvenor Goodhue—the greatest American architect of his generation—rests in the Episcopal Church of the Intercession in the far northwest of Manhattan. Here we explore the inscriptions and sculptural contents of this "token of the affection of his friends" and "his great architectural creations that beautify the land." A description of the liturgical, theological, and historical principles of an unrealized design for the conversion of an existing conference room into a new Blessed Sacrament Chapel for St Albert the Great, Austin, Texas. I am excited to announce the publication of the article "Marginalized Modernisms: Progressive Architecture for Minority, Immigrant, and Rural Churches in Texas" in the Journal of History and Culture which is published by Prairie View A&M's Texas Institute for the Preservation of History and Culture. 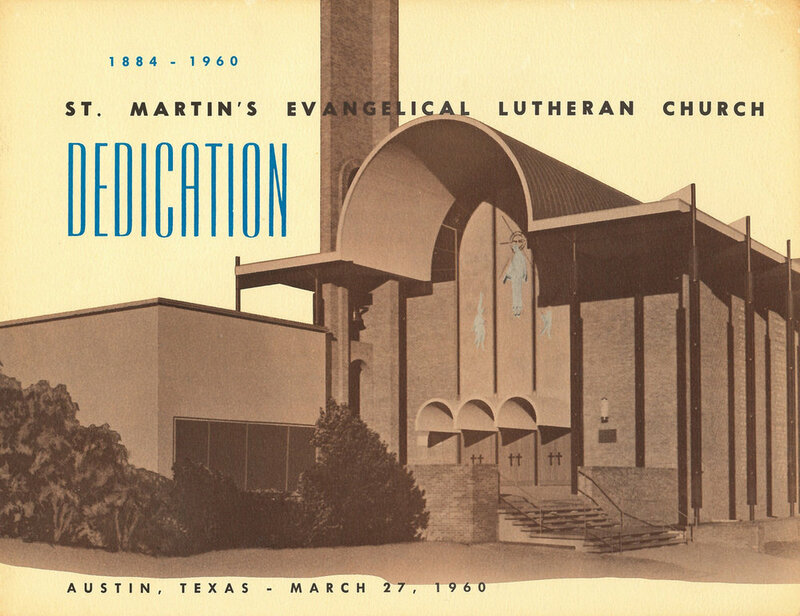 Information about a lecture given at the University of Texas as part of ongoing efforts to advocate for the preservation of Saint Martin's Evangelical Lutheran Church. This church is by far the best example of non-residential mid-century architecture and holds a special place among the finest modern American churches. The lecture addressed on the influence of the church and the people associated with it on the history of the architecture and building arts community of Austin in the middle of the twentieth century. On the implications of the theologies of two prominent 12th-century abbots in the Benedictine tradition—Abbot Suger and St Bernard of Clairvaux—as they touch on themes relevant to architecture, especially simplicity, proportion, light, and the divine darkness. 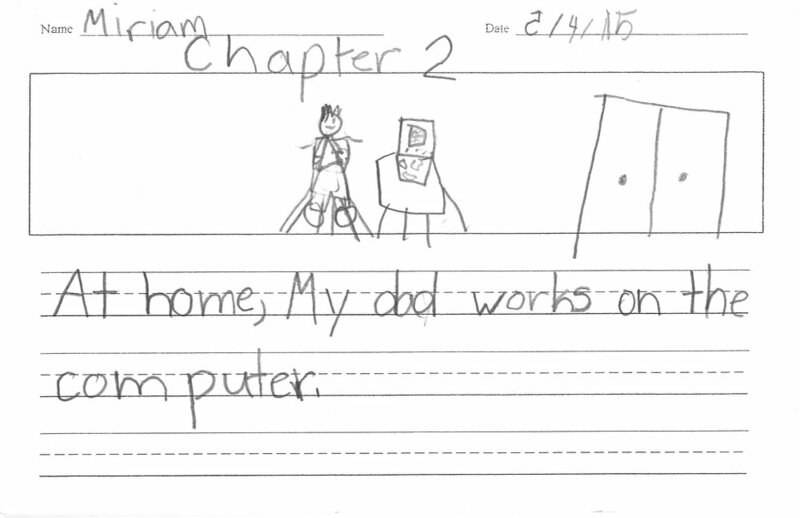 My daughter Miriam wrote a story about me at Kindergarten, and they sent it to me at school for Father's Day. And I have to share it because it is adorable. "Building for Now and the Future" is the tag line of the capital campaign for the new parish hall / activity center for our parish. Here is a photo of the view she's recreating here. VE is actually making the new building look more like this. We haven't actually started construction yet. I think that is me on the right in my daily lay cassock/tunic. Lots more praying than building so far... But I'm so glad she sees the connection of ora et labora already! 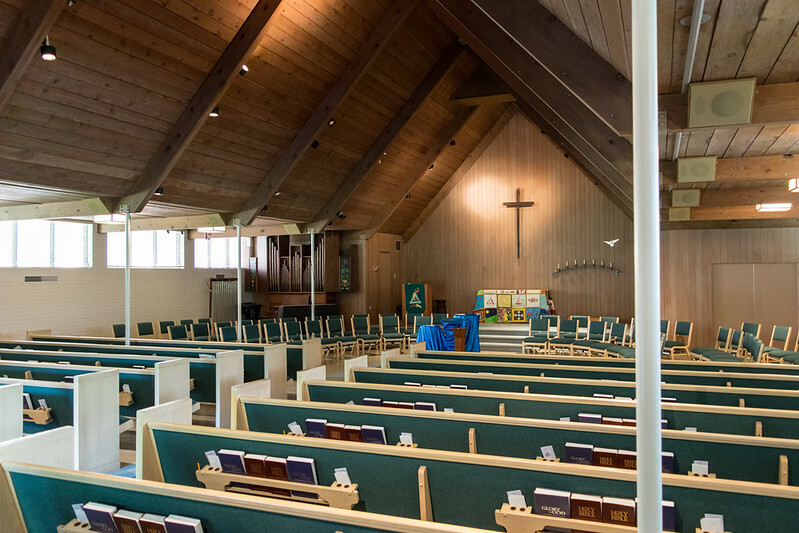 I am excited to participate in an upcoming tour of St Martin Evangelical Lutheran Church with MidTexMod, the local docomomo_us chapter. Despite its relative obscurity in architectural history literature, it is among the most significant churches of its time with local, national, and international confluences and volumes to reveal about both individual, denominational, and universal aspects of church architecture. My lecture will touch on some of the themes from the article I wrote for docomomo as well as examining how it fits into its larger contemporary scenes in the Lutheran church and in modern architecture (including some photos from my trip to St Dominic in New Orleans, built at the same time with stained glass by the same artist). Dennis Cordes, congregant and Preservation Architect, will address some of the preservation challenges the building presents and give insight into the building's continued use. The docent-led tour will give us a chance to dig into some of the particular details of the architecture. 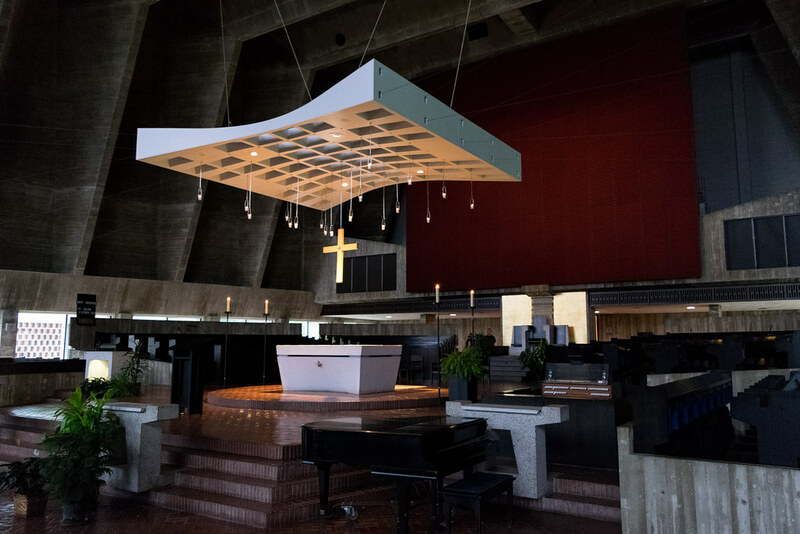 Join us to learn about one of Austin’s most striking Modern examples of ecclesiastic architecture – St. Martin's Lutheran Church. 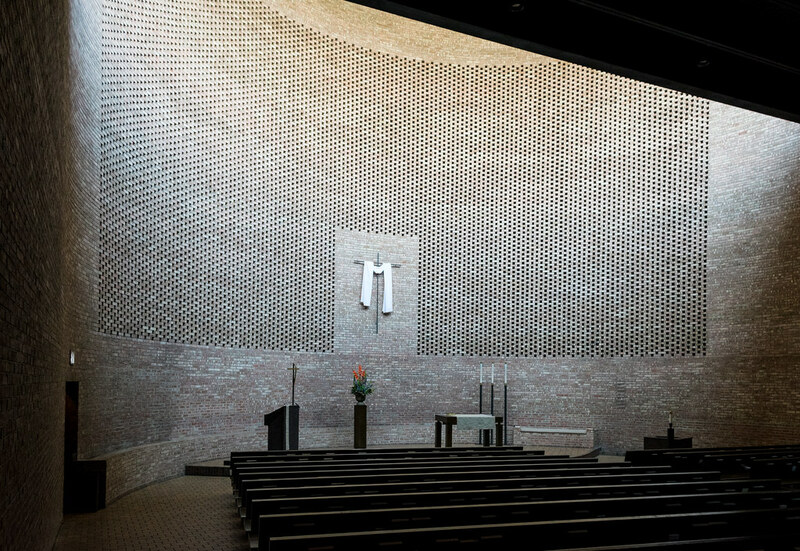 Completed in 1960, the church was designed by Robert Mather of Jessen Jessen Millhouse and Greeven as a Modern abstraction of the Christian basilica. 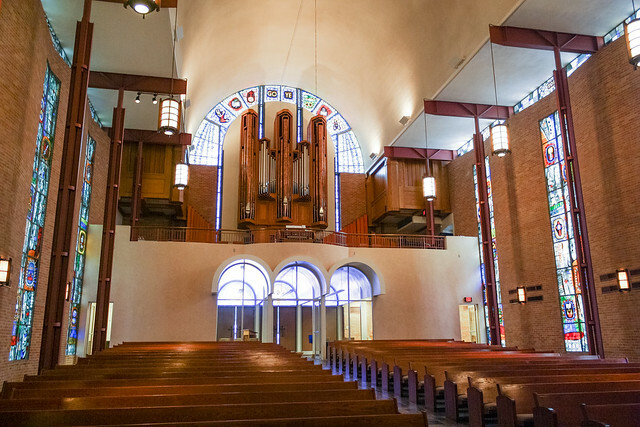 The building features an arresting Modern chapel with a soaring vaulted nave and dramatic stained glass, a remarkably intact sanctuary, and sculpture by Charles Umlauf, as well as a more utilitarian education wing including classrooms, kitchens, and a basketball court. 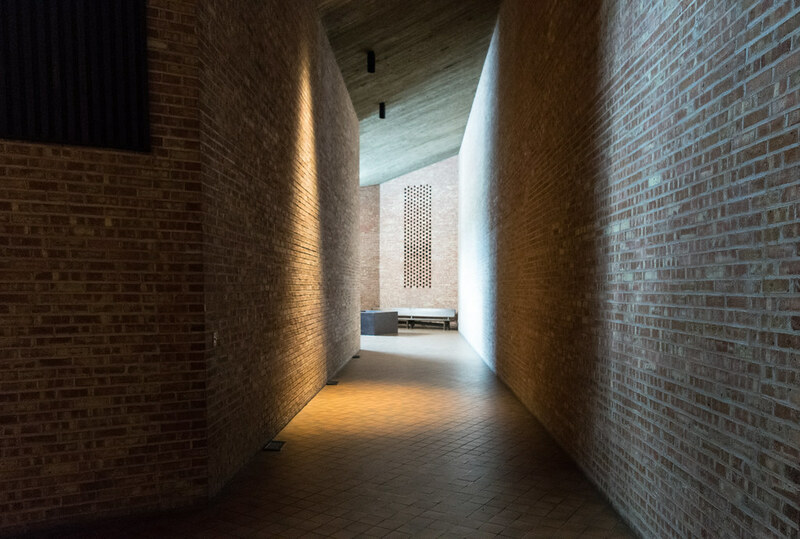 Mid Tex Mod will be hosting a tour of the church with a lecture on the building's design, significance, and art by MTM member Jason John Paul Haskins, Assoc. AIA, LEED AP BD+C. Jason is a church-building researcher and design consultant who writes about liturgy, architecture and history on the blog Locus Iste. He holds a B.S. in Architectural Studies and an M.Arch from University of Texas with additional course work at Columbia University and a research emphasis on the architecture of the 19-20th century liturgical movements. Jason’s lecture will be followed by a presentation on the building’s preservation by Dennis Cordes, congregant and Preservation Architect (retired from the Texas Historical Commission and Texas Parks & Wildlife). Mid Tex Mod is excited by the opportunity to highlight this remarkable Modern resource. Our tour will be in conjunction with Preservation Month, established in 1973 by the National Trust for Historic Preservation to highlight historic preservation across the country. Please email midtexasmod@gmail.com to RSVP by May 14. Tickets are not required, but we will be accepting donations at the door (with a $5 suggested donation). 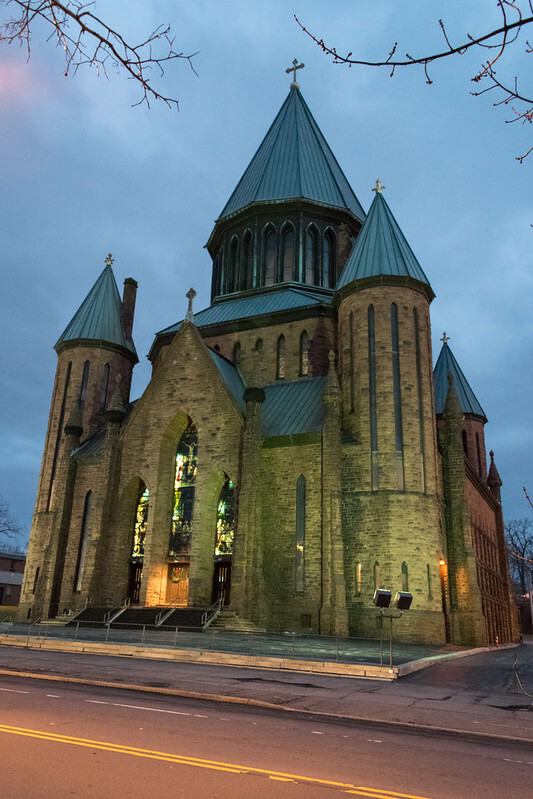 A profile of one of my personal favorite church buildings and a "definition" of church architecture based on reflections on the Transfiguration. The historical context and some potential strategies for contemporary implementation of the veiling of images during Lent. As an example, I show how I created the veils used by my own parish. Design and fabrication of a simple kneeler. While traveling during the holidays I visited a fascinating (and slightly disturbing) church in Schenectady. Completed in 1899, St John the Evangelist, in the Union Street Historic District (NHRP), is the result of a collaboration between the pastor and architect. The pastor, Monsignor John L. Reilly, outlined the design of the church from inspiration collected while traveling in Europe. 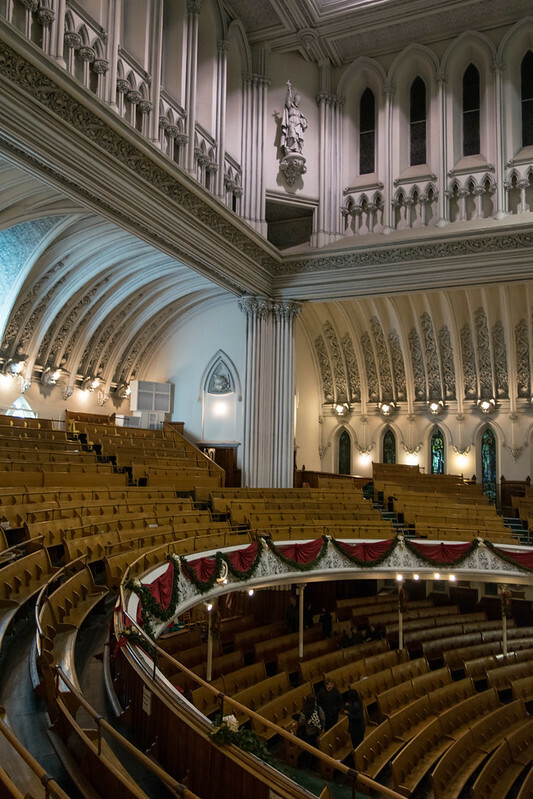 Many American churches have been inspired by their pastors' European grand tour, but the end result in this case is not the obvious replica that resulted in the vast majority. The "supervising architect" (as he is credited in multiple accounts) was Edward Loth, an architect from Troy. 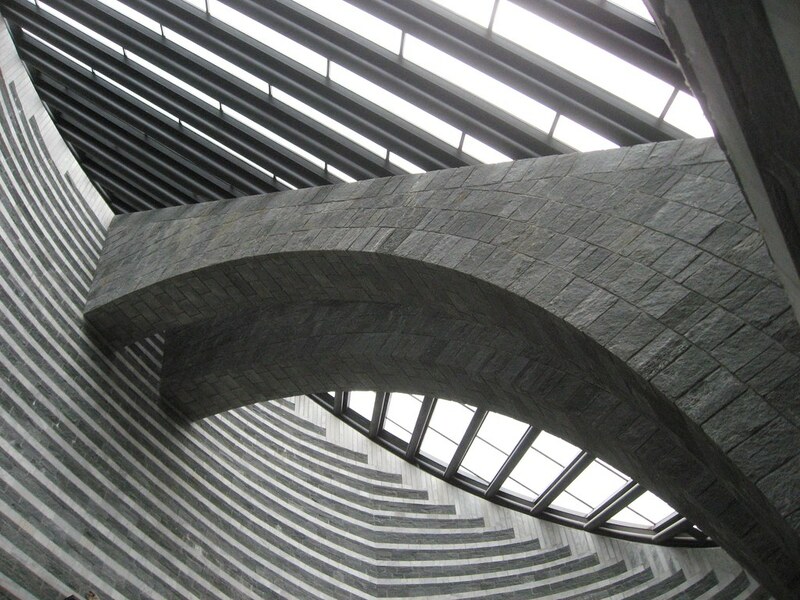 This is the most dramatic and unusual of his church designs. 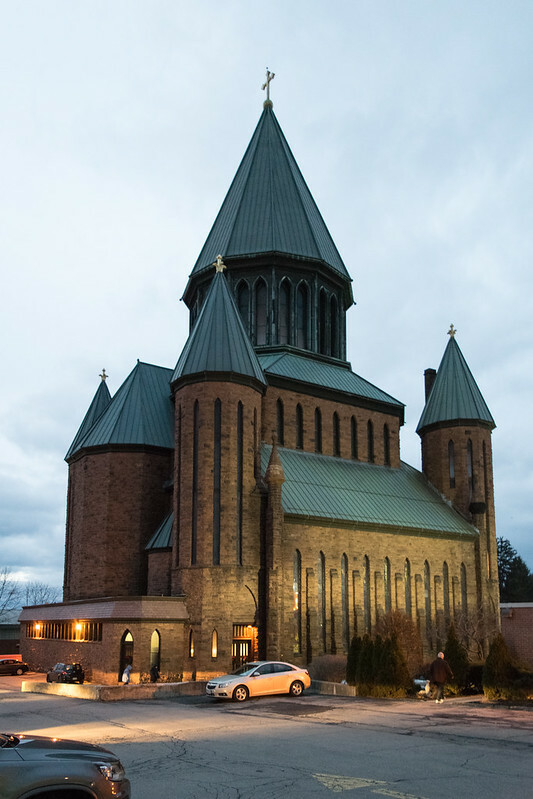 Loth also designed a number of churches in the towns around Albany, including my parent's current church in Ballston Spa and St Patrick, Watervliet which was torn down in 2013. Loth studied in Germany, and I wish I knew where and with whom. I would also love to know what specific examples Monsignor Reilly saw and which ones he referenced in the design. 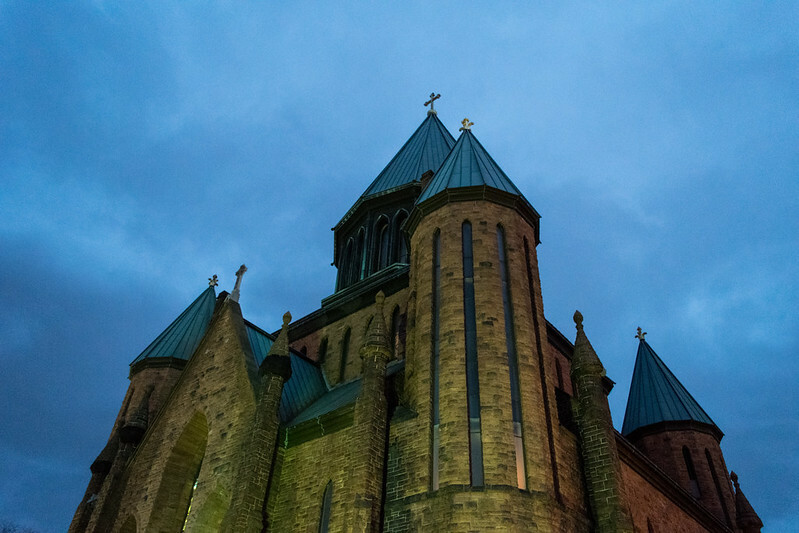 I visited for an evening mass on a cold overcast day as the sun was setting and with the streetlights and exterior lighting on, the lights made for some interestingly lit and colored, if grainy, photos. 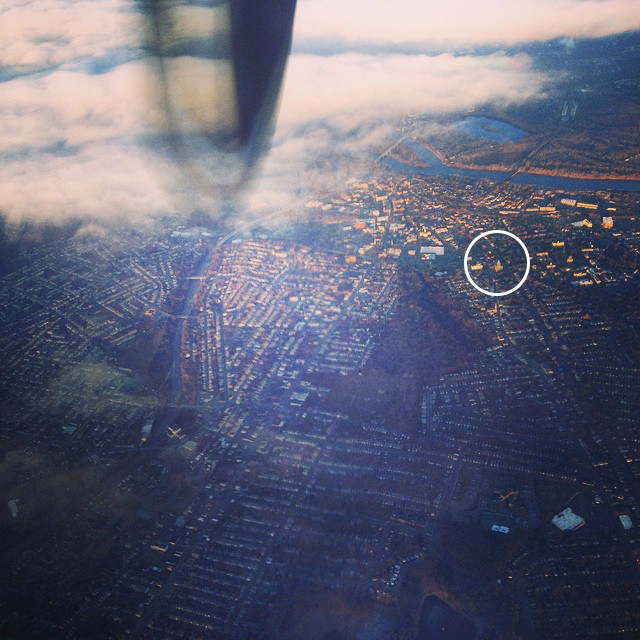 Then as I flew out of the Albany airport, I saw it again. It was hard to miss the dramatic verticality of its presence in the urban fabric. The axis mundi drew my eye immediately, even before I realized what town we were flying over. It has a similar impact diving up to it. The striking monumentality and the geometric composition of the building were some of the reasons I wanted to see this church. 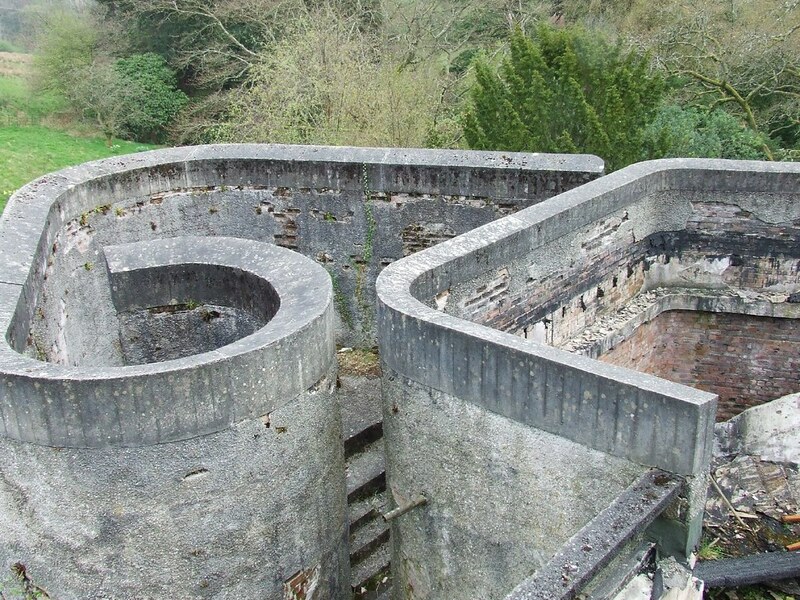 Another reason was the seating on the interior, with its steeply raked main floor below a circular balcony of more than 180 degrees. 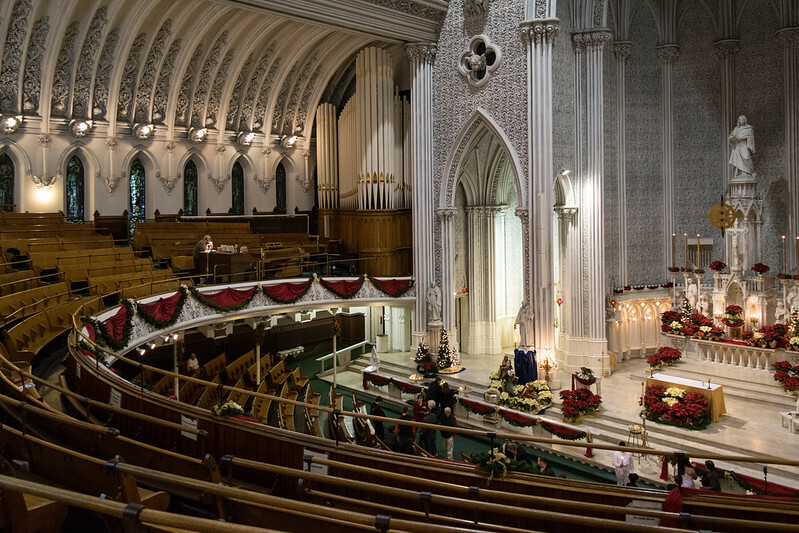 Naves based on auditorium seating and balconies are common features of American churches in the late 19th century, but both are rare features among Catholic churches. But even among the auditorium-type churches, the densely stacked configuration inside a square tower is very unusual. Unusual among auditorium churches, too, is the configuration of what stands in for the "stage." Since the majority of these churches were for spoken word-centric celebrations, the focal point was generally a raised dais with a pulpit. But here, the focal wall is an elaborately developed tripartite wall of altar apses. The openness of the central apse, its interlocking composition with the circular balcony, and the boolean formation of the volumes combine to strike an easily legible balance between the unity of the interior space and the hierarchy of the liturgical components. 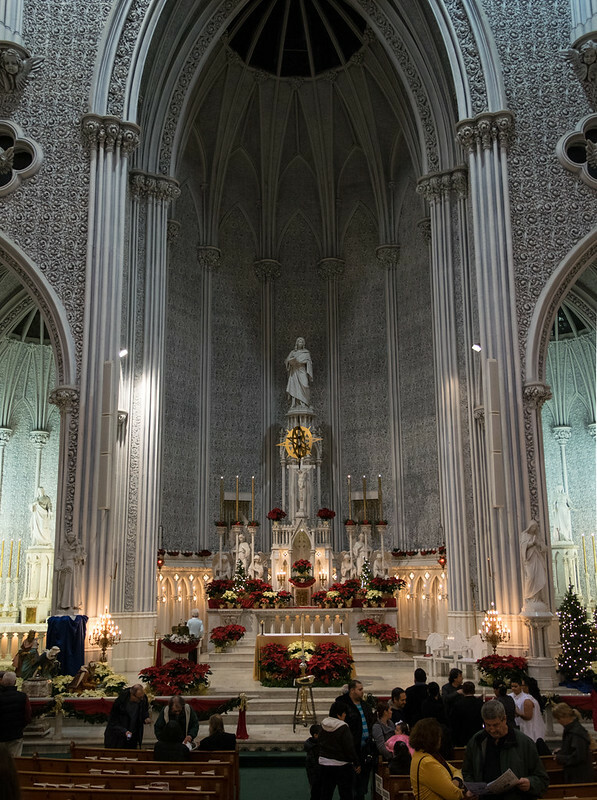 Compared to the more typical contemporary basilicas, including those designed by Edward Loth such as in St Mary, Ballston Spa, celebration at the high altar is extremely immanent without losing its dignity and distinction. My sense is that the apse and altar here results in a posture more appropriate to the Tridentine liturgy. Of course now we have the two-part altar with the high altar as a principally decorative function and the altar of sacrifice free-standing in front. It is a necessary adaptation both for celebration versus populum, when appropriate, and for churches which were designed such that the rubrics of the Rite of Consecration could not be followed to the letter. In the Rite in the 1895 Pontificale Romanum—which was in effect for the consecration of this church, assuming it had made it over and been put in use locally—the Bishop sprinkles the altar while circling it (circuit altare) and sprinkles the church "starting behind the main altar" (incipiens retro altare majus). I do not have the text of the 1596 Pontificale, but I understand it gives the same instructions. This arrangement should never be designed for new churches, but does not need to be a regretted adaptation. This is a perfect case where it could be an effective arrangement, if only the forward altar of sacrifice were treated with due dignity and give stature appropriate not only to its function but also to the scale of its sanctuary. This is true of both the Extraordinary and current forms of the liturgy and for the celebrant standing both toward the apse and toward the nave. The composition of the focal wall gives a clear hierarchy between the high altar and the two side altars while achieving a balance between the elevation and integration both proper to the sanctuary. At the same time, there remains something slightly off about the whole that I can't quite identify, but that may just be the fact that it is unfamiliar or overflow from the issues with the ornament. Unfortunately, the current usage does not retain the clarity of the composition; there were a number of oddities that reflected a disappointing attitude of apathy in the celebration that did not live up to the nature of the liturgy or reflect the intriguing structure's attitude toward worship. The church is extremely "modern" in a number of different senses of the word and with both positive and negative results. On the positive side we have a sophisticated composition of volumes where space (in its modern conception) is a primary element in the overall design. The exterior prefigures some of the geometric Backsteinexpressionismus, with the obvious difference in material. 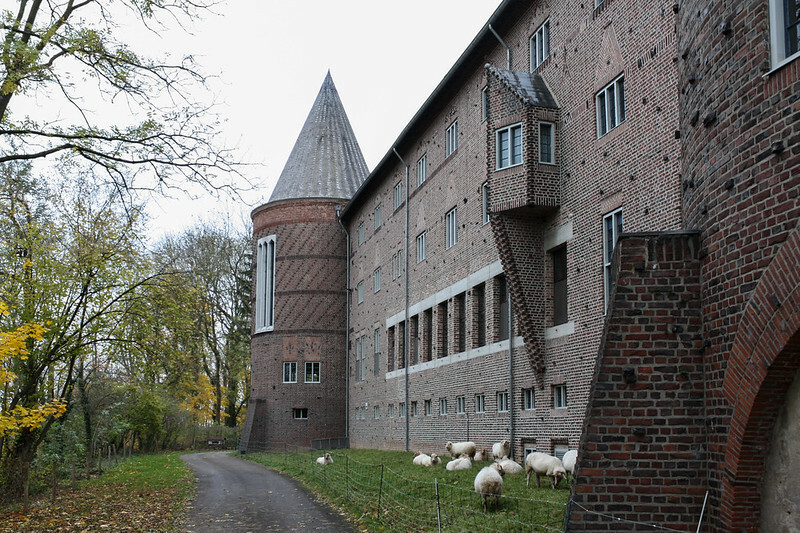 In particular, it reminds me of the early work of Dominikus Böhm, leading up to the Abdij Sint Benedictusberg (1922). Works such as these highlight continuity of the later architectural developments often characterized with an over-emphasis on rupture and revolution. Something about the proliferation elongated abstractions of gothic windows suggest an active engagement with the precedents not seen in Loth's other designs. And the seating arrangement may be classified as modern because of its emphasis on perceptibility of the celebration in the sanctuary. Closed-minded anti-modernist types might reject this arrangement outright, but with the juxtaposition within the more dominant components of the interior there is much more going on here. In person it really does not feel like an auditorium, in the ways that detract from the "higher" forms of Christian worship. The congregant in his or her seat is much more caught up in the milieu of the whole building. Ultimately the arrangement reinforces the clarity of orientation toward the altar. Though I have mentioned them together, the auditorium style seating is one thing and the balcony quite another. Balconies in general are problematic for participation because they emphasize the posture and spirit of a "spectator" for those sitting there. This is among the least offensive balconies I have seen, mostly on account its integration and imminence, but it still has problems. 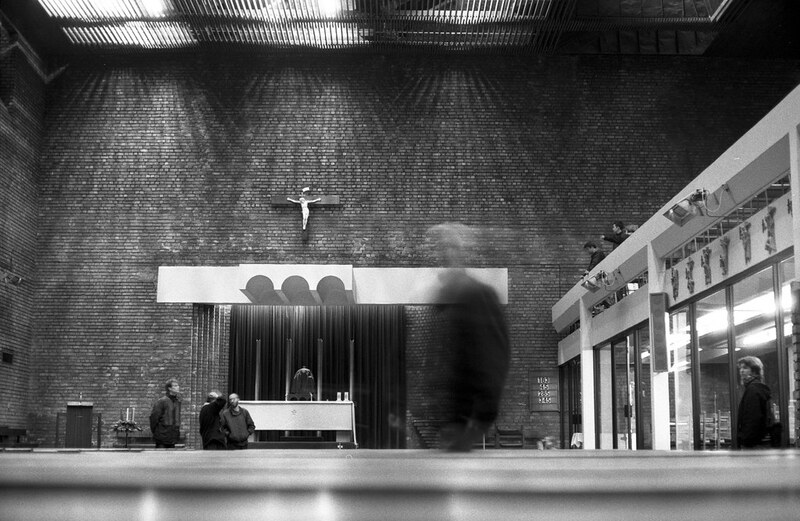 The church is also profoundly modern in its separation of its ornament from the structure. The disunion is particularly evident in the interior; and the very fact that it is more evident in the interior reflects a further disjunction between the interior and exterior. 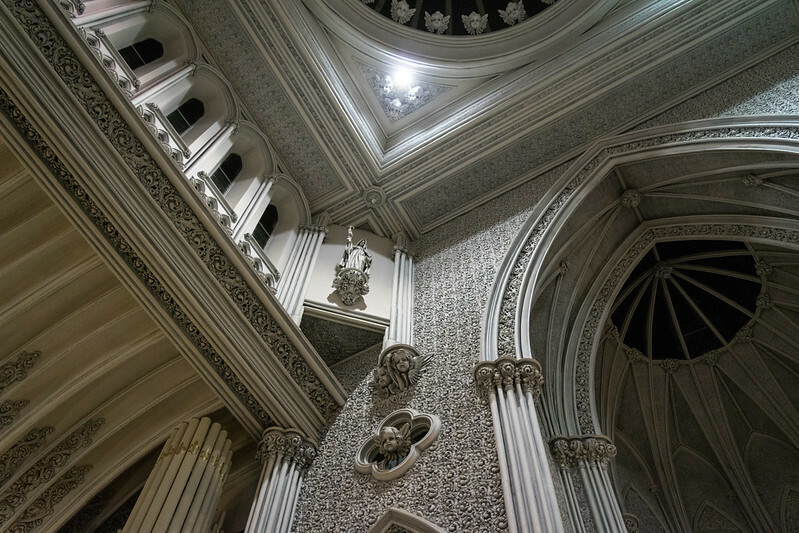 The church exhibits the problematic type of 19th century eclecticism (where complexity does not lead to richness) in its ornament and a tendency towards individualistic sentimentality in its art. The stark whiteness of the whole composition was interesting, especially since I visited in the middle of writing my piece on the Chartres Polychrome Controversy. I guess it imparts something of Wincklemann's "noble simplicity," but that is ultimately annihilated by the sculptural exuberance of it. On the other hand, this formal exuberance is only possible because it is monochromatic. This is one of the best examples where the ornament is essentially frosting. The clustered columns are clearly false, and only occur as a framing device clearly divorced from any structural function. Note the difference between these and the single slender metal columns supporting the balcony. What is worse, it is all made of poorly constructed plaster with an infill executed in a grotesquely inflated grotesque. The word "grotesque" immediately sprang to my mind and has not departed since. I've since determined that four distinct meanings of "grotesque" apply here. In this case, I mean a "distorted" version of a "fanciful combinations of intertwined forms" that began life as a Roman infill painting technique. This is something I would like to try to make work even today. 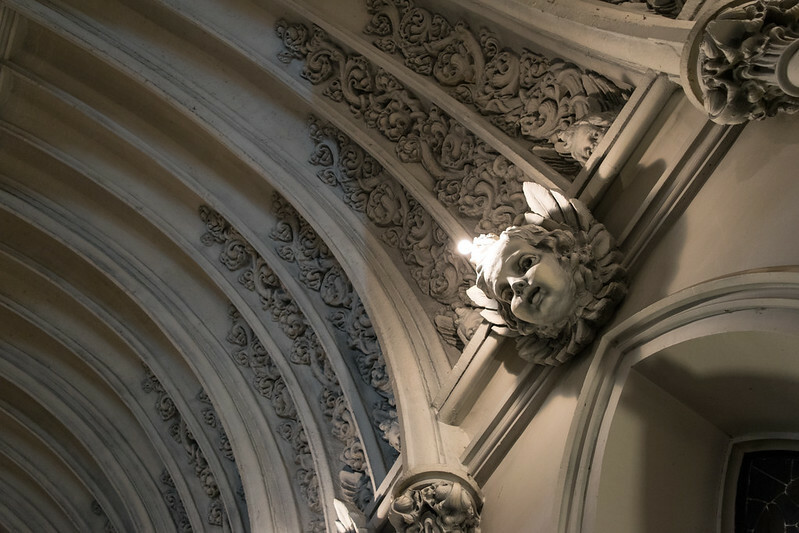 The tendrils in the transepts are much better, since they continue and heighten the rhythm of the actual structure, tie this part of the building to the focal wall, and engage the negative space of the concave ribs. 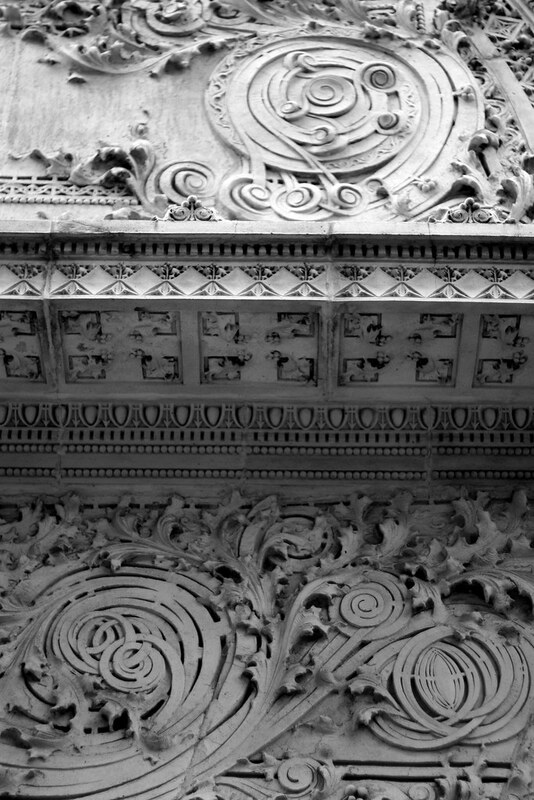 Which brings us to the most ridiculous (and grotesque) part of the whole thing: the grotesque grotesques (using two additional meanings, in the sense of "abnormal and hideous" or "absurdly incongruous" rendition of a "face used as architectural element"). Or more properly, the putti, which are mistakenly called cherubs. The cherubim are awesome beings depicted as multi-winged living creatures attendant to the majesty of God. They originate in Hebrew scriptures and are thus proper to those aspects of Christian worship which cry "Gloria!" and "Alleluia!" and "Sanctus!" Putti, on the other hand, originate in Classical paganism and come to the fore in Christian art in its lowest and most extravagant period, and more importantly, among the trends that most severed the liturgy from devotion and personal piety. By the late 19th century, any depth that might have existed in their Quattrocento iterations had been reduced to the most pathetic and sentimental. Thus they are two faces of the humanist individualism that is poison to the fullness of Christian worship. The proliferation of putti—supposedly more than 500—inside St John the Evangelist, Schenectady simply come across as distracting and more than a bit creepy. The intent was most likely to represent the "heavenly host," and childlikeness (not childishness) is certainly an aspect of the Christian ideal; however, the this depiction is of a milksop host and a sentimentally pandering image of an inordinately comforting heaven. One other item that I would like to investigate further is the electric lights. 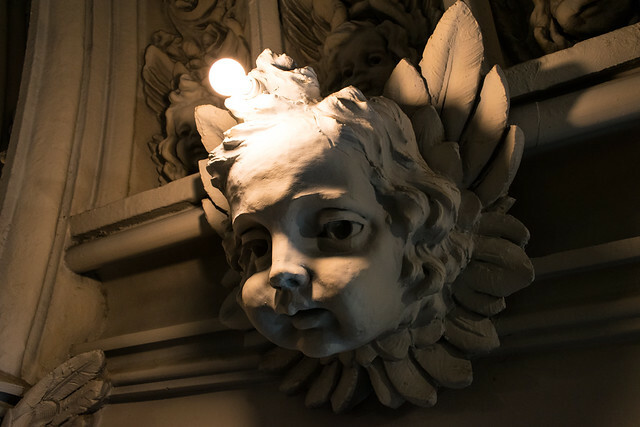 There are lamps oddly placed in the putti's foreheads and a few in the perimeter of the central apse. Given that Schenectady became the home of both the Edison factory and General Electric in the decades prior to the church's construction, it is possible that they are original, or at least early additions. Their placement seems to be more for effect than for general lighting, which would suggest a different approach to the use of electric lights—one fitting to a city interested in showcasing its technological prominence—than the more utilitarian approach of the last half century. This was going to be a short post sharing a few photos, but as you can see there is quite a bit to chew on in this one. Much of its interest and peculiarity derive directly from standing among the transitions at the turn of the century. Thus it encapsulates a number of trends in the period of church building (1833–1962) I find the most fascinating and under-appreciated. A discussion of the design strategies applied in the design of a Triduum order of service booklet. A discussion of the liturgical principles applied in the design of a Triduum order of service booklet. In the second installment of the series, we visit Nativity of Mary in High Hill, the grande dame of the Central Texas Painted Churches to explore how decorative painting may be integral ornament. This Saturday (11 October 2014), the MidTexMod chapter of docomomo_us will host their component of the national Tour Day event which highlights modern architecture across the country. Last year's tour featured the architecture of John S Chase in East Austin. This year's will focus on the midcentury houses and churches of Milton Ryan. I will be speaking on Ryan's church architecture and its relation to the concept of domus ecclesiae in modern church architecture as we visit University Presbyterian Church. Adjacent to Trinity University, O'Neil Ford initially designed a lift-slab church with translucent marble windows for the congregation before Milton Ryan drew from the best of modern residential architecture to create the award-winning tent-form building that was eventually built. We will compare the two designs and explore the history of this church and Ryan's other church in Victoria. Mark your calendars and join us for docomomo Tour Day 2014. Mid Tex Mod is pleased to partner with Nest Modern to host a tour of three Milton Ryan properties in the San Antonio area. Milton Ryan, born in Rockport in 1904, was an architect who started his career designing neo-classical tract houses before turning to Modernism in the 1950s. Ryan is best known for his Mid-Century Modern houses in the Terrell Hills neighborhood. As his work has often been overshadowed by that of his San Antonio contemporary O'Neil Ford, our organization is excited to highlight some of Ryan's residential and institutional work. We are thrilled to begin Tour Day with lectures about Milton Ryan by Stephen Fox and Jason John Paul Haskins, followed by tours showcasing three of Ryan's commissions. Below is a general schedule of the day's events. A brochure with more specific information and addresses will be provided at University Presbyterian Church. Tickets are not required, but we will be accepting donations at the door (with a $5 suggested donation). Please email midtexasmod@gmail.com to RSVP. “The Architecture of Milton A. Ryan” by architectural historian Stephen Fox, Fellow of the Anchorage Foundation of Texas. “Milton Ryan and the Domestic Modern Church” by Jason John Paul Haskins, Assoc. AIA, LEED AP BD+C. 2:30 p.m.-4:30 p.m. - Tours of two Milton Ryan houses in Terrell Hills. The houses are located on Eventide Drive. More specific information and directions will be provided at University Presbyterian Church. Since it is probably going to be a while before I can process all of my photos and write longer reflections on the places I visited during my time in New York City, here is a preview made up of some of the photos posted to Instagram while on the road. It was admittedly an unusual New York City trip; a co-worker was quite disappointed that I neither partied nor went to a Broadway show. What I did do was to visit churches, of course. But one of the stand out highlights was a day trip excursion to visit Jean Labatut's Stuart Country Day School in Princeton, New Jersey. The school hosted a series of events marking their 50th anniversary over the past year that included a lecture given by Jorge Otero-Pailos and J. Robert Hillier. Hillier served as draftsman and designer on the project as a recent graduate in Princeton. Otero-Pailos wrote Architecture's Historical Turn as a history of the development of phenomenology within the American architectural discourse. He credited Labatut—and specifically Labatut's Catholicism—with providing the ground for Princeton to become "the first academic hotbed of architectural phenomenology and soon thereafter a major center of postmodern architecture." After the 50th anniversary, the maintenance staff rediscovered the original model of the school (built by Hillier) in storage. Seeing the unrealized design for the "Cor Unum" chapel that was to be the heart of the school was a highlight of the highlight of the trip. Venturi Scott Brown Associates eventually built a much larger multi-use space in that spot. Robert Venturi and Denise Scott Brown were students of Labatut at Princeton. There is a small chapel in the cloister wing of the building (now used as offices as there are no longer nuns in the faculty). A narrow stair winds its way around this chapel from the basement to what was a an accessible roof for the cloistered sisters. I can't wait to spend more time parsing this incredible building and the ideas behind it. The mosaic is the work of Hildreth Meière, who is a new hero of mine. Her work is absolutely brilliant and occupies a similar position between originality and continuity that Goodhue's architecture represents (especially when compared with Ralph Adams Cram's stoic perfectionism which is actually more abstract). Her work occupies part of what I'm coming to view as limb of early twentieth century art that was largely chopped off by what we might call the onslaught of history and the desire for abrupt change. One of my favorite aspects of St Bart's is the proliferation of lettering on the building. Since Goodhue also designed fonts, I'm assuming the inscriptions are his own designs as well, but I want to look into that more in depth. When I found out Goodhue's tomb was, well a thing, and then also on the island, I had to try and visit that as well. I also visited the campus of Skidmore College in Saratoga Springs. O'Neil Ford designed a new campus for the school in the 1960s, so it was interesting to see his work in an unusual climate and the impact that had on the designs. His buildings there are a study in unity of differences and how to compose a cohesive campus without simply repeating form. One of the most distinct is another little chapel in the woods: the only exclusively timber structure on the campus. We also visited the art museum by Antoine Predock, which was by far one of his best works. It was formally bold, but its form did not overshadow its role as a museum. The galleries were well lit and distinct enough to be interesting and provide space for exhibits to interact with, but not so much as to overpower what was on display.